Beginnings of Orange Grove TX. Mr. Heinrich (Henry) Duevel, Sr., was born in Germany and grew up around Hanover, Germany. As a young man, he learned the trade of a shoemaker. In 1877, he married Doris Koch, also of Germany. Henry Duevel worked as a shoemaker as long as he was in Germany. His wife, Doris Koch, had an uncle and aunt in America who always wrote to the Duevels to come to America. They had a nice farm there and were getting old and wanted to retire and wanted the Duevels to come and work the farm and they could help them get started. After much thinking and talking, the Duevels decided to come to America. In the fall of 1882, Henry Duevel, Sr., his wife, Doris Koch Duevel, her mother, Sophia Koch, who was a widow, and their two daughters, Dora Duevel (Mueller), Anna Duevel (Heider) and one son, Heinrich (Henry) Duevel, Jr., came by ship to America and landed in Galveston. Then they came by train to Shiner, Lavaca County, Texas, and settled on Mr. and Mrs. Koch’s farm. After a few years, they were thinking of buying a farm of their own. Another daughter, Ida Duevel (Boehm) was born to them on February 1, 1897. After looking around for a place of their own to buy, he couldn’t find anything that suited them. Then he met a man who told him that he knew a man in DeWitt County, Texas, who had a nice farm for sale. “Yes” they said, “that’s in the little community of Lindenau, Texas.” They told him how to get there and he found it. He liked it and bought it. 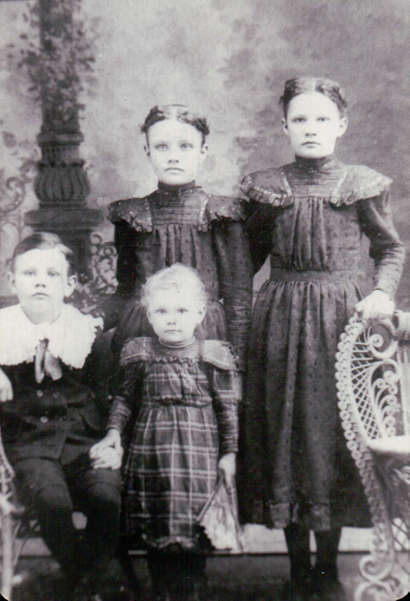 In the fall of 1897, they moved to Lindenau and lived there for seven years. Then he said to his family, “I would like to have a larger farm so you children don’t always have to go and help the neighbors finish chopping and picking cotton.” All the family was satisfied with that. Some time later, he met Mr. Wild who lived just a few farms away from his. He said, “Henry, I heard you would like to buy a larger farm. I’ll sell you mine. My wife and I want to sell our farm and move to Austin and retire.” “Alright, if I can sell mine, I want to buy yours.” In just a few days, Henry Duevel had his farm sold. He and his wife went over to the Wilds to look at the place, they liked it and bought it. After the Wilds were ready and had moved out, the Duevels moved in and they were happy. After a few years, Henry Duevel bought another track of unimproved land. He sold half of it to his oldest daughter, Dora, and son-in-law, Adolph Mueller. They built a house and made other improvements and put land into cultivation. Henry and his son, Henry, Jr., improved their land, built a house and put land into cultivation too. Mr. Duevel’s second daughter and husband, Anna and Emil Heider, moved on the place and farmed it for two years. Then the big excitement of the new community of Orange Grove in South Texas came along. The newspapers in Cuero, Texas, were full of ads. Mr. Charles Schwab, a real estate man from Cuero and a friend of Mr. Duevel’s, talked to him about this big excitement of selling land in South Texas. He said “It is a real paradise. Let me take you and several other men down there and show you what I have there.” So, they went to Orange Grove. Mr. Duevel, Sr., his son-in-law, Adolph Mueller, Mr. Joe Boehm, and Mr. V. Schenk each bought a track of land northwest of Orange Grove. Only Mr. Charles Skarke’s land is north of Orange Grove. When the men came back home, they had lots to talk about and plan. They needed a carpenter to build the houses and barns. They needed men to cut the brush down and burn it. They got big steam plows to plow the land and then had all the roots and prickly pears off and made fences. They decided to take their mules and wagon and load up what they needed and drive overland. Adolph and Dora Duevel Mueller thought it would be too much for them to improve the land he bought as they still had lots of work to do with their new farm in Lindenau. So, he asked Henry Duevel, Sr., his father-in-law, if it would be possible if he would give him the land he bought up there in Lindenau for the place he had there beside his place in Orange Grove. Then Henry, Jr., said “Yes, Dad, let’s do that. I want that place.” So he came along with the wagon train. When they arrived in Orange Grove they put up a big camp on the west end of which is now Emil Klaveman’s place. His father bought that place a year or so later and moved there. The last day of December, 1912, the train cars were loaded in Cuero with household things, cattle, hogs, chickens, corn, etc. The train left at night and was in Orange Grove the next morning. Mrs. Emil Heider’s mother (Mrs. Doris Duevel) came along with her to help take care of the Heider’s little son, Arthur. Arthur was ten months old at the time. (Arthur Heider now lives in Alice, Texas, and is an insurance agent at the Farm Bureau office). They both came on the train and arrived on New Year’s morning, 1913. They stayed with old-time friends, Mrs. Frieda Brand and her in-laws, Mr. and Mrs. Gerhard Brand. They stayed there until their household things were hauled from the train car, and set up in their new home which was only partly finished. Mr. Joe Boehm had the barn built first so the Fred Bartosch family, who also came from Lindenau, could move in. They rented the farm. The house was built later. The Charlie Skarke family first moved in the barn until the house was finished. The Shenks’ house was finished and they could move in. Mr. John Pump and Son of Cuero were the carpenters. When everybody was pretty well settled, they started to work on their land. Henry Duevel, Jr., became sort of lonesome. He went by train to Cuero to see his girlfriend, Miss Selma Roggenkamp. They decided to get married on February 20, 1913. Then, after the wedding, he brought her to their new home in Orange Grove. In 1915, the Duevel’s youngest daughter, Ida, married Erwin Boehm, son of Joe and Emelia Boehm. They came to Orange Grove to live on his father’s farm. In 1916, Henry Duevel, Sr., sold his farm in Lindenau to Mr. and Mrs. Joe Grossman. Several years later, they sold it again and bought a nice farm east of Orange Grove. Here they build a nice home and lived until they passed away. Some of their children are still living there. Henry and Doris Koch Duevel, Sr. moved to Orange Grove after selling their farm and bought five acres of land from Emil Heider. They built a nice home on it and retired. They were happy to have three of their married children living close around them. They also enjoyed their grandchildren. They lived there until they passed away -- Doris Koch Duevel died on May 29, 1940, and Henry Duevel, Sr., died on June 18, 1940, just 20 days apart from each other. They are buried in Orange Grove at the Sons of Hermann Cemetery, south of the city. - The above was written by Ida Duevel Boehm on June 22, 1976.